True Scale Highly Detailed Small Logo of the “Chevrolet Belair” badge script on the front left of chest, on the Tee, showing the smaller image of the Red two door ’57 Chevrolet Bel-Air car finished off with “Shoebox” and Chevrolet Bow Tie emblem” script underneath. The artwork is of 3 second generation models of the Bel-Air family, introduced by Chevrolet. Firstly in the forefront, we have the classic Red 1957 two door hardtop Bel-Air Sport Coupe, with highly detailed chrome work on the grille, beautifully detailed bright trim work on the body and period correct colour matching of the interior noticed through the front windscreen. The White wall tyres finish off this masterpiece beautifully. Following closely behind is this beautiful example two tone coloured 1956 Chevrolet two door Sport Coupe Bel-Air. This 1956 Bel-Air received a face-lift with a more conventional full-width grille, pleasing those customers who didn't favor the “Ferrari” inspired '55 front end. Distinctive two-tone body side treatments and graceful front and rear wheel openings completed the "speed line" restyling. Single housings incorporated the taillight, stoplight, and backup light assemblies. This artwork clearly displays the “chromed” engine detail such as that big radiator sitting proud for cooling this big girl down. Lastly, sitting back where this recognised shape started it all, is the formidable classic 1955 two door Bel-Air Sport Sedan. For 1955, Chevrolet's full-size model received new styling that earned it the "Hot One" designation by enthusiasts alike. This beautiful art work shows the two tone colour of White Roof appearance, and period correct body trim bright work. The background of the Tee accents the typical 1950’s Service Garage in a ‘ghost like’ appearance’, followed by the unmistakable ‘Chevrolet Bow Tie” badge emblem in Blue with White outline at the bottom of the main image. 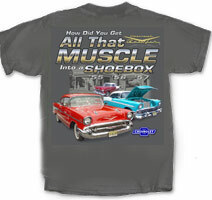 Tee shirt Colour: Available in Charcoal only, with genuine GM Official Licensed Product Tag.